It all starts here. 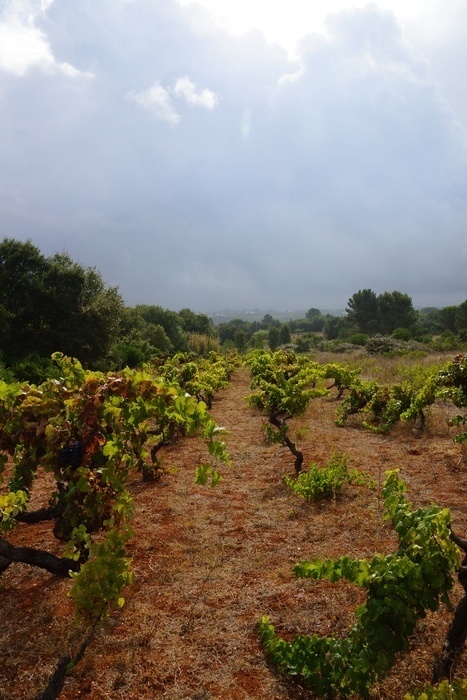 This is their oldest vineyard - the grape vines are well past their prime years. The object of our desires, at least for the day. 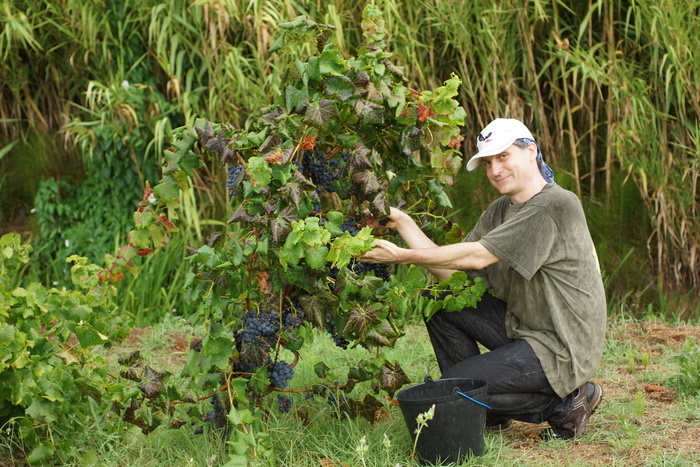 Eric with a particularly well-endowed grape vine. Apparently the locals were totally impressed that we continued to work in the rain. Of course, in both Seattle and the Netherlands, if you aren't willing to do stuff in the rain, you'll never do anything... and in truth it was too hot for us when the sun was shining. First surprise: the wine is not made from a particular kind of grapes. They grow at least four different kinds, both white and red. This has the practical advantage that in any given year, if one kind doesn't do well, the others will probably make up for it. 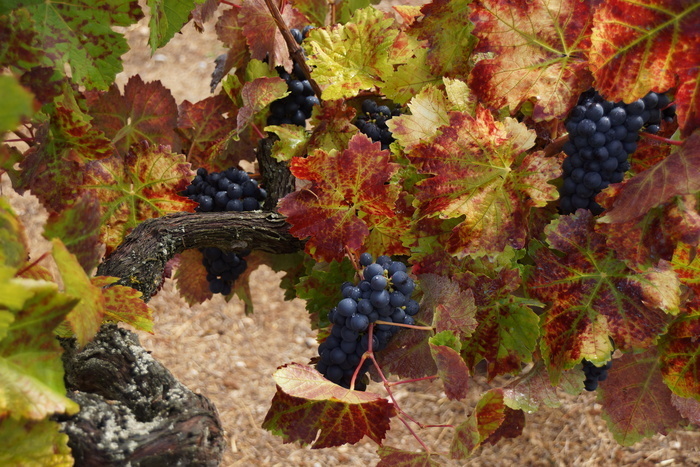 The grapes also taste good, and seem to be more or less the same as the type you buy to eat. We were advised, if the grapes taste good, the wine will taste good . Next surprise: lunch was grilled on a fire built by burning a pile of dried brush, more or less in the dirt road alongside the field. Lunch was grilled sardines (with a zucchini for Eric). We'd been told in advance that was the traditional lunch when picking the grapes. 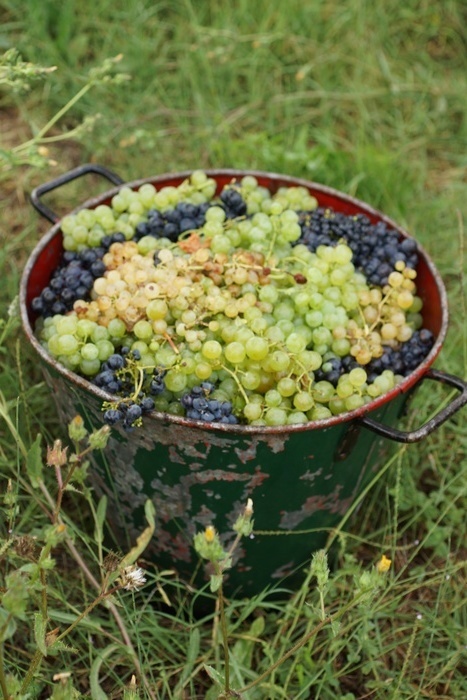 Surprise number three: the amount of grapes one vine can produce! 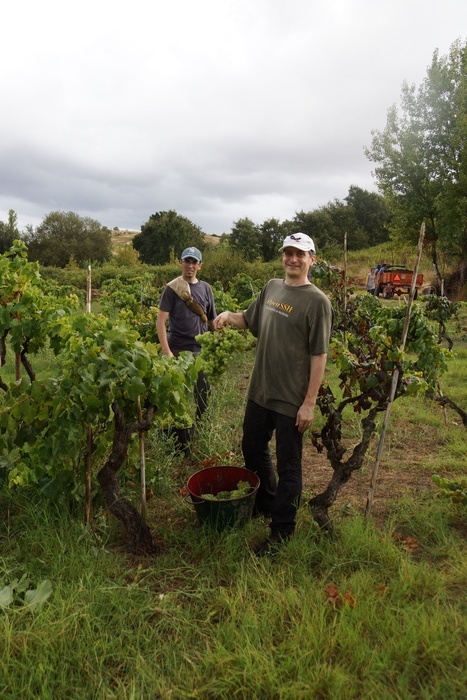 Some individual vines filled three or more buckets. This bunch made a substantial contribution by itself! 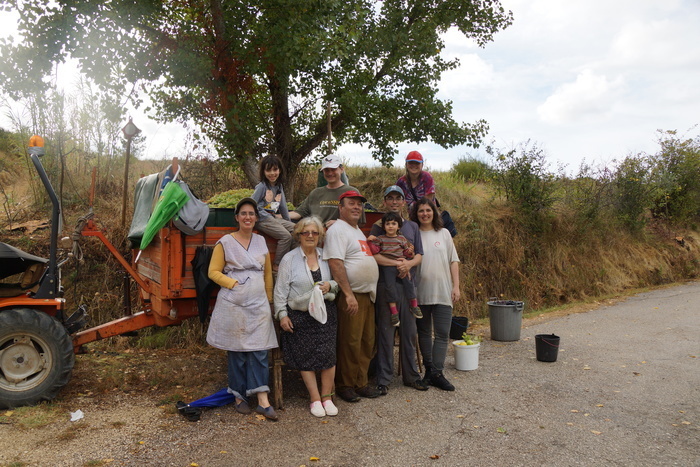 The guy in the background (our friend's brother) is wearing a folded burlap sack on his shoulder, not as a fashion statement, but to protect his shoulder as he hurks buckets of grapes up to the truck. Considering he carried about 1000kg of grapes from the field to the truck that day, the shoulder pad was very much warrented. Finished picking the last field! The family poses by the truck. Note the two giant tubs of grapes in the bed of the truck. Surprise four: the grapes were not washed. This makes sense, when you consider Surprise five: no commercial yeast is added. You may have noticed a grayish film on grapes or other fruit that you buy at the store (you can see it clearly in this photo). That's wild yeast, of exactly the type you need to turn grain into bread or grapes into wine. 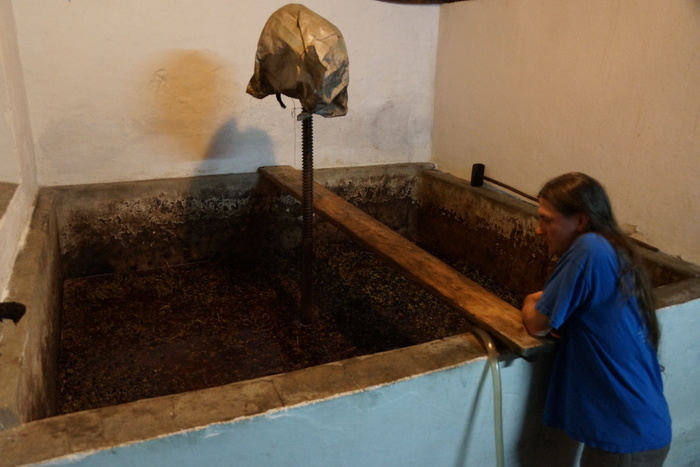 Washing the grapes would wash off a lot the yeast, slowing down the fermentation and allowing bacteria and other undesirables a chance to move in. 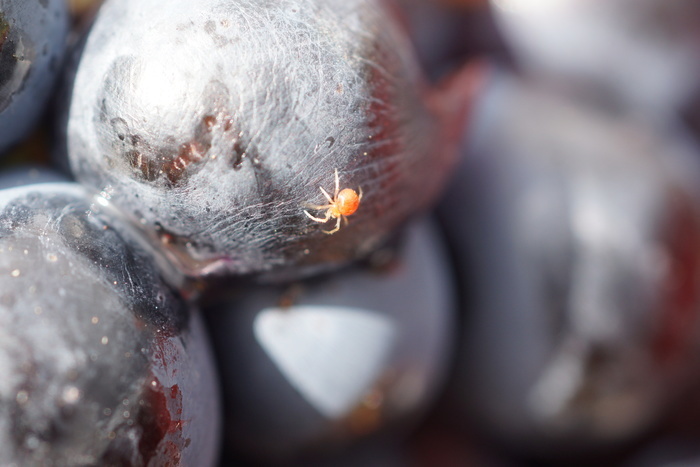 But, this means that real wine has a certain percentage of spiders... but not this one. I got him out and released him back into the vineyard. 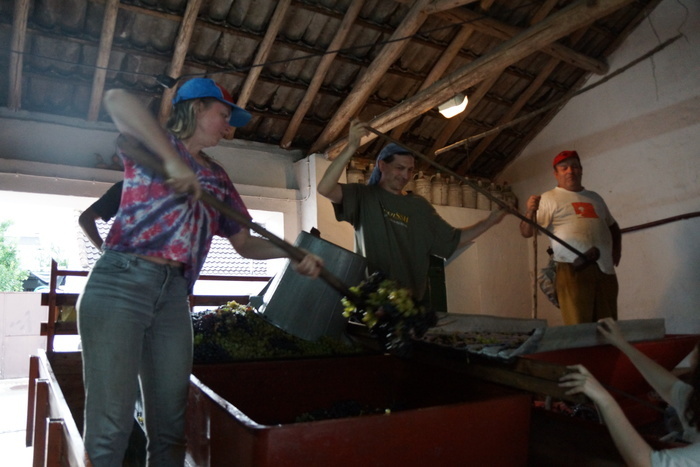 Step one is to put the grapes through a mill. 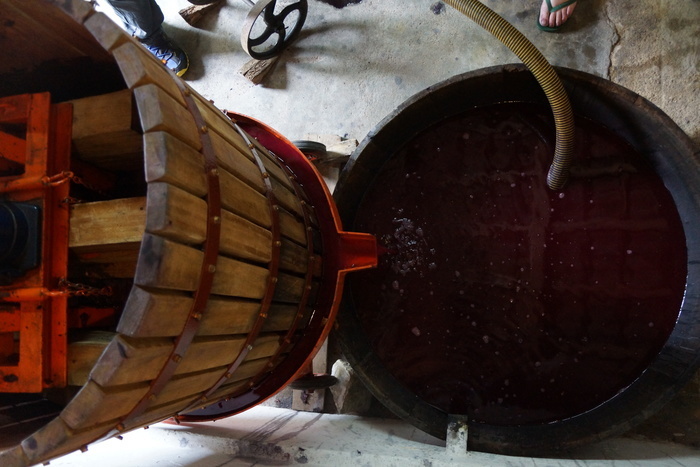 This doesn't pulverize the grapes, but just cracks them open a bit so the juice starts mixing with the yeast. Apparently the locals were also impressed that girls can operate pitch forks (apparently normally this part is the men's job). I didn't tell them about my collection of power tools at home. To be fair, it actually does take a bit of a knack to fork up the grapes without knocking them off the stems. 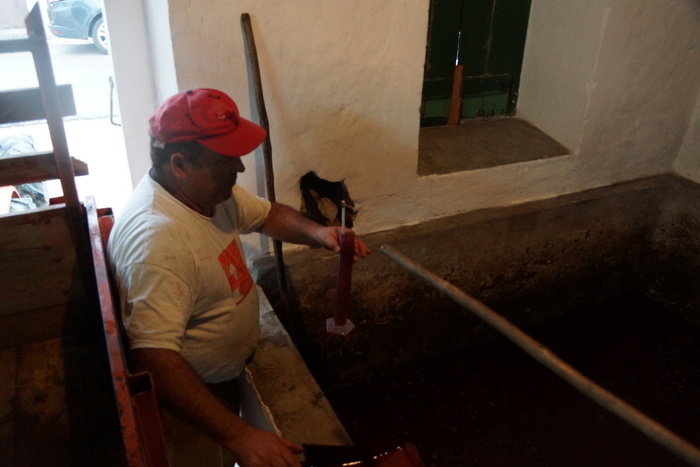 The grapes will be fermented until almost all the sugar has been converted to alcohol. 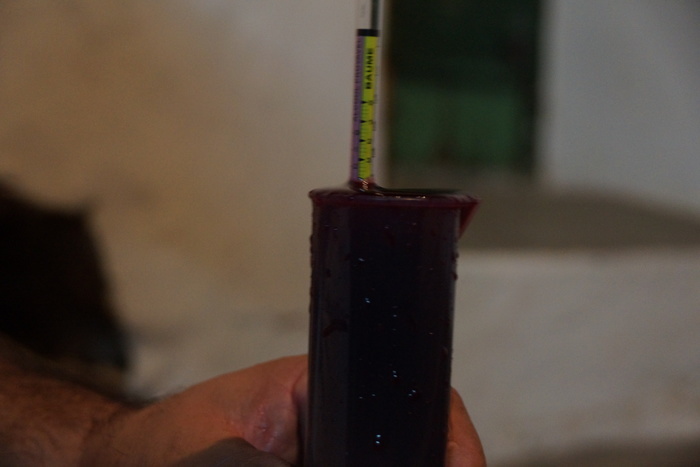 This is measured by checking the specific gravity before and during fermentation. This hydrometer makes it easy - it measures in an inverse scale where 0 = no sugar left, and then counts up by percentage points of alcohol that will be made when the sugar is fermented. Eric looks in on the proto-wine. Surprise number six was that this is the fermentation chamber - open to the air. Surprise seven: we actually did squish the grapes with our feet! Apparently they usually use a tool now, which is basically a big wooden mallet, but feet work better - it's just a lot of work to do it unless you have help. So we got on our shorts, washed our feet in the wash bucket, and then climbed in. 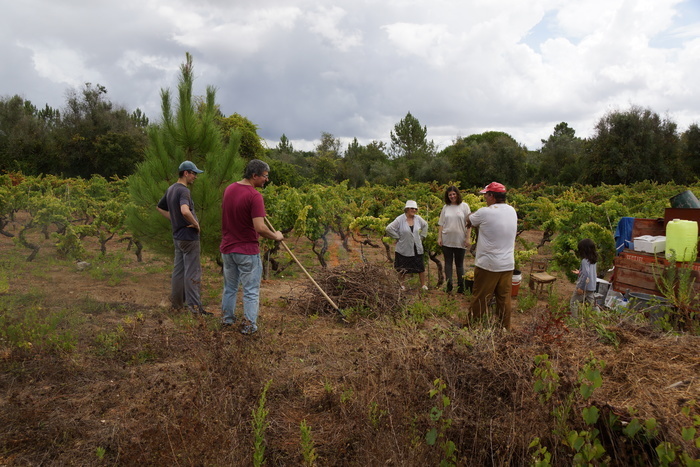 The traditional way is to form a line, arm in arm, but that quickly dissolved to us just milling around in the grapes. As near as I can tell, the plan is just to squish them and stir the mixture around. Surprise eight is that we didn't do this just once, but did it a couple times a day every day until the fermentation was nearly complete (in this case, about five days). On the last day the mixture just rests undisturbed. This is pretty much what it looked like from day 2 to 5. Some days you could see more foam around the edges, indicating more active fermentation, some days there was less. 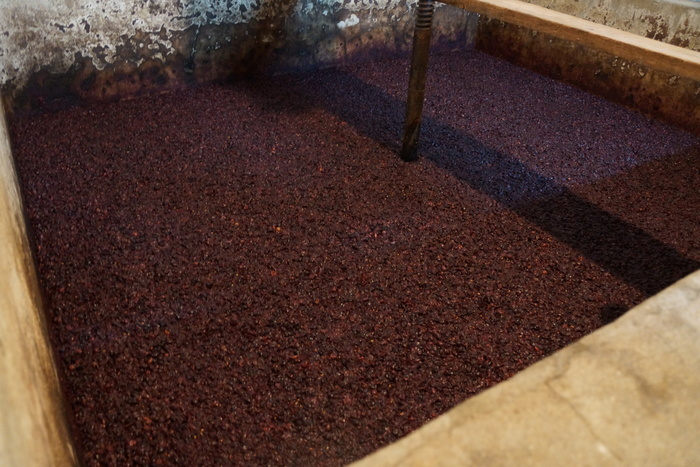 Walking through it, you could feel there were warm spots (where, presumably, more fermentation was happening). There did not seem to be a specific prescription for the stomping, but I gather the idea was to push the grapes that had floated to the top back to the bottom (so that none of it would have a chance to dry out or get bacteria moving in), and to thoroughly mix the whole batch (so active yeast were redistributed into places with less active yeast). When the hydrometer indicated 3% of alcohol left to gain by further fermenting, everything is left to rest for a day. 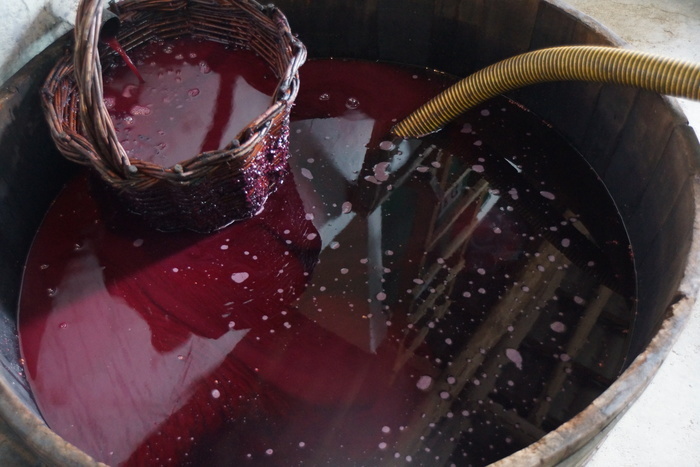 The wine is drained out of the fermenting tub and into a wooden tub, filtered through a wicker basket. 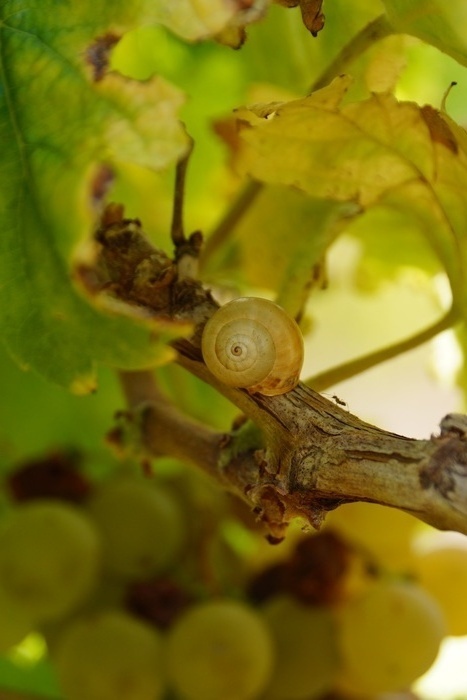 Most of the solid matter is simply pushed away from the drain, so the remains of the grapes act as their own filter. This photo is from near the bottom, where there are more sediments, but the swirls of sediment really show the color! 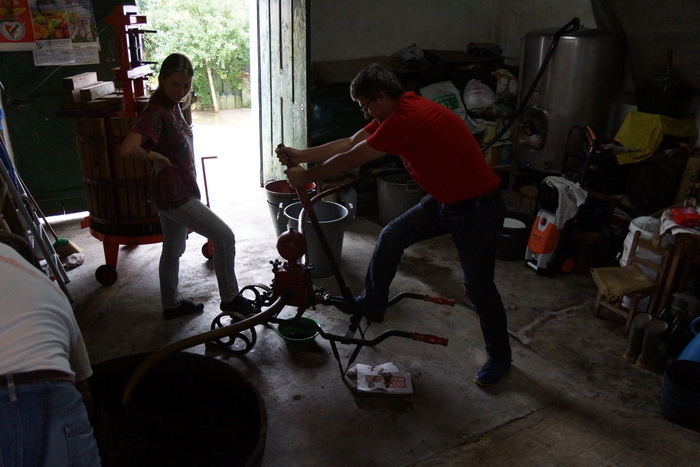 We used a hand pump to pump the wine over to the vat, where it will age for 2 months before being transferred to bottles and other containers. The hand pump looks just like the ones you see firemen using in old pictures. The hand pump is both simple and efficient (here it's taken apart for cleaning, so you can see the four balls that act as valves). It seems to do about 20L/min. 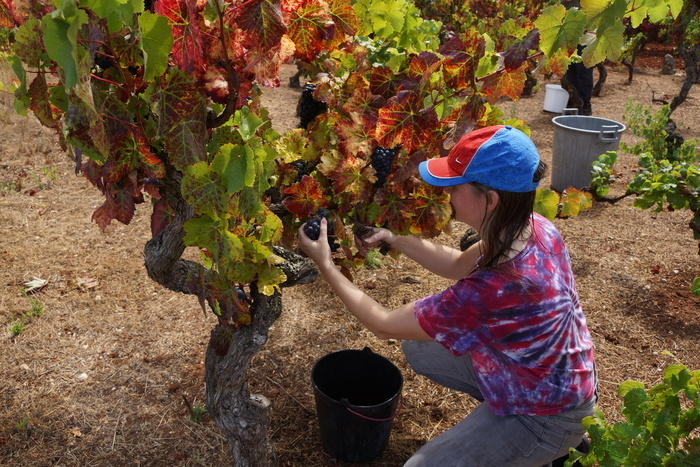 The next step is to separate the stems from the remains of the grapes. This is so the remains of the grapes can be pressed to squeeze the remaining wine out... which yeilds more wine than you might think. 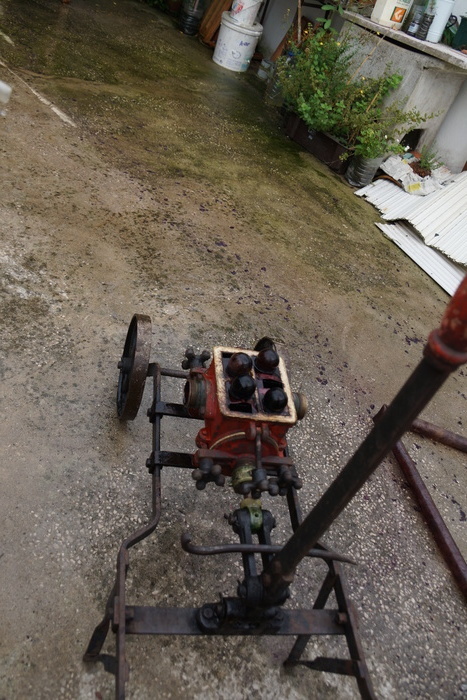 (The press works by use of something very much like a car jack.) Squeezing the stems will tend the wine toward vinegar, so once the grapes are pressed, the stems are added back in and the whole thing is pressed again to get a separate container of wine for making vinegar.